Designed to give you quiet confidence during power outages, the Q6500 QuietPower™ Series Inverter Generator is more than 60% quieter* than standard generators and can deliver 6,500 starting watts** of reliable backup power. QuietPower Series inverter technology and a noise-cancelling shell give you power that's 60% quieter* than standard generators. Inverter technology also leads highly-efficient performance and a 14-hour run time**. With a design that's 45% more compact**** and 30% lighter**** than standard generators, it's easy to move and store. QuietPower™ Series inverter technology produces consistent power without all the noise of standard generators. Combine that with a protective noise-reducing shell, and you get reliable power that's more than 60% quieter* than standard generators. QuietPower™ Series inverter technology gets more from every drop of fuel, saving you gas and money at the same time. This efficient performance leads to a 14-hour run time***. 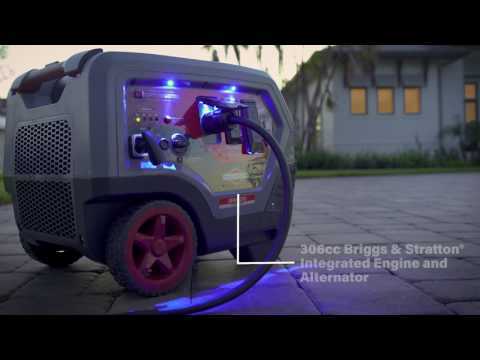 A design that's 45% more compact**** takes up less garage space, while a total weight that's 30% lighter**** than standard generators and a telescoping handle make it easier to move.